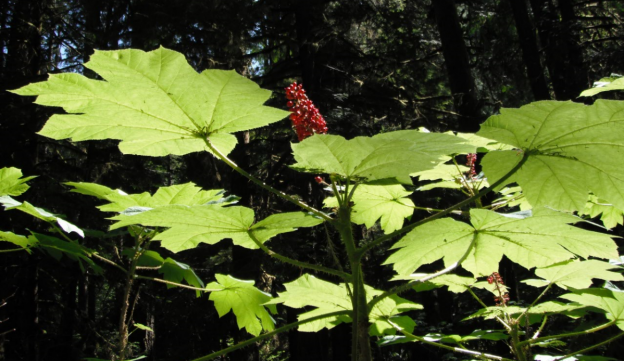 Names: The genus name, Oplopanax, is derived from hoplon, meaning weapon and panakos meaning panacea or “all-heal”—referring to the medicinal qualities of these shrubs and their relationship to the well-known Asian herb, Ginseng, Panax ginseng. 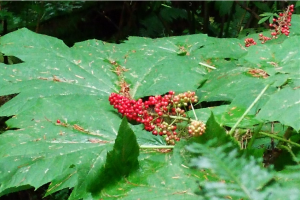 Oplopanax is sometimes misspelled, Ophlopanax. Both the common name and specific epithet, horridus, refer to its spiny, wicked-looking appearance. Scientific synonyms include: Echinopanax horridum or horridus, Fatsia horridum, Panax horridum, and Ricinophyllum horridum. 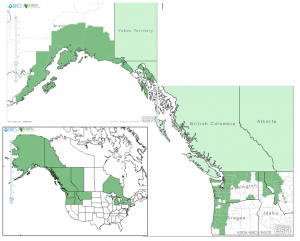 Distribution: It is mostly in the west; from southern Alaska and the Yukon Territory to southwestern Oregon in the west; to Alberta, the Idaho panhandle and neighboring Montana in the east; with a disjunctive population on islands in Lake Superior; (listed as threatened in Michigan). 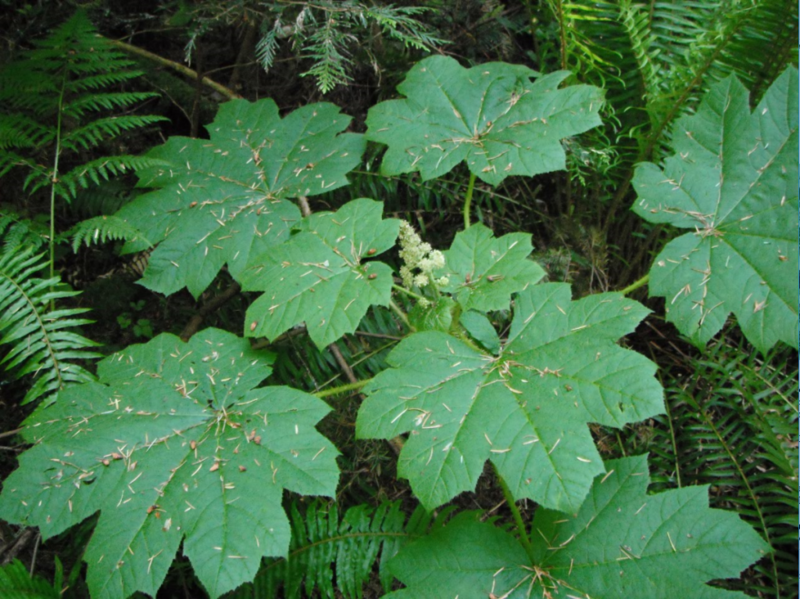 Growth: Devil’s Club grows erect to 3-9 feet (1-3m) tall or sprawling, growing in clumps. Devil’s Club often grows by streams and rivers. Habitat: It is found in moist woods, especially along streams. Wetland designation: FAC+, Facultative, it is equally likely to occur in wetlands or non-wetlands. Diagnostic Characters: Leaves are large, palmately lobed, similar to a maple leaf, with numerous spines along the veins on the undersides, and along the petioles. Flowers are small and whitish, borne in globe-shaped clusters arranged on a tall, pyramidal spike. The bright-red berries are somewhat flattened. The very thick stems are covered with yellowish spines. In the Landscape: Although this plant has been called “fearsome” and “formidable,” it is boldly attractive. Due to its spreading, mounding form and its large, maple-like leaves it can’t help but draw your attention. In the wild, the stems can create an extensive spiny barrier to hikers desiring to get to a woodland stream. In the garden, it needs to be given plenty of room, in a moist spot, where it is unlikely to be closely encountered. In late summer, spikes of red berries make a striking contrast against a sea of green. Phenology: Bloom time: May-July; Fruit ripens: June-August, persisting over winter. Propagation: Seed can be sown in a cold frame as soon as it is ripe in the fall. Stratifying at 40º (4º C) for 30 days is optional according to one source; another source recommends a 72 hour running water soak, followed by an alternating 100 day cold, 100 day warm, 100 day cold moist stratification regime. Either way, seeds may take up to 18 months or more to germinate. Cuttings or layering are possible; stem cuttings from horizontal branches in late spring to early summer; or root cuttings taken in winter. Division of suckers during the dormant season or judicious digging of small plants in the wild may be the easiest propagation method. 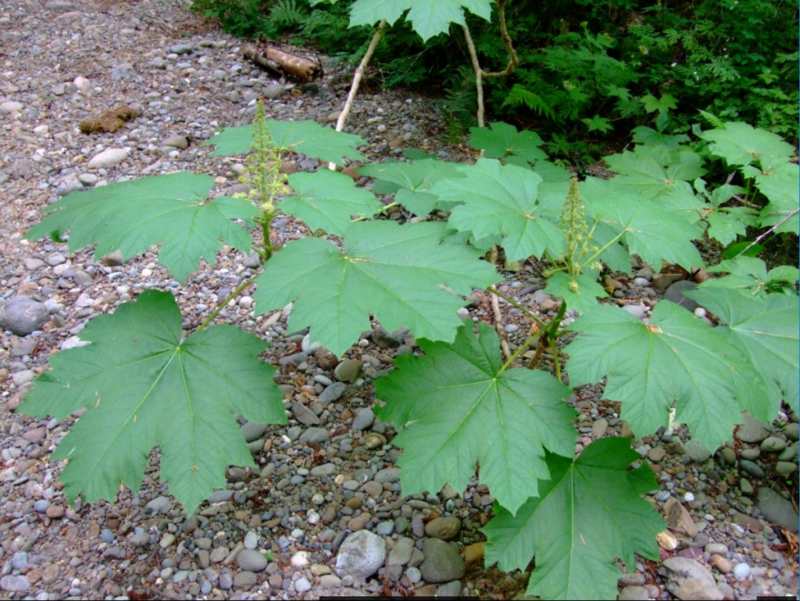 Use by People: Devil’s Club was, and still is, an important medicinal herb for many native tribes. The greenish, inner bark of the roots was the part most often used. 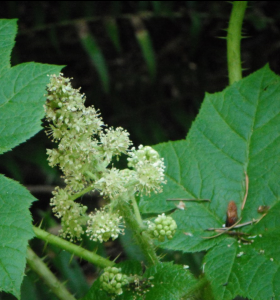 It was chewed or boiled to treat many ailments, including aches and pains (especially due to arthritis), sores and wounds, colds and flu, digestive disorders, lung ailments, cancer, diabetes and before and after childbirth. It was also used for cleansing. The inner bark was chewed during purification or power-seeking rituals by hunters, warriors and shamans. The ash of stems was mixed with grease to rub on swellings and to make a reddish brown tattoo paint used by dancers. The berries are considered poisonous but have been mashed, rubbed into a foam on the scalp to combat lice and dandruff, and to make the hair shiny. The wood has been used to make lures and hooks for fishing. Bark shavings were mixed with different berries to make paint or basket dye. The young, spring buds were sometimes boiled and eaten. The spiny stems were used as protective charms against supernatural powers. 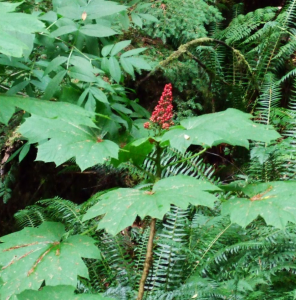 Devil’s Club was considered an all around good luck plant! 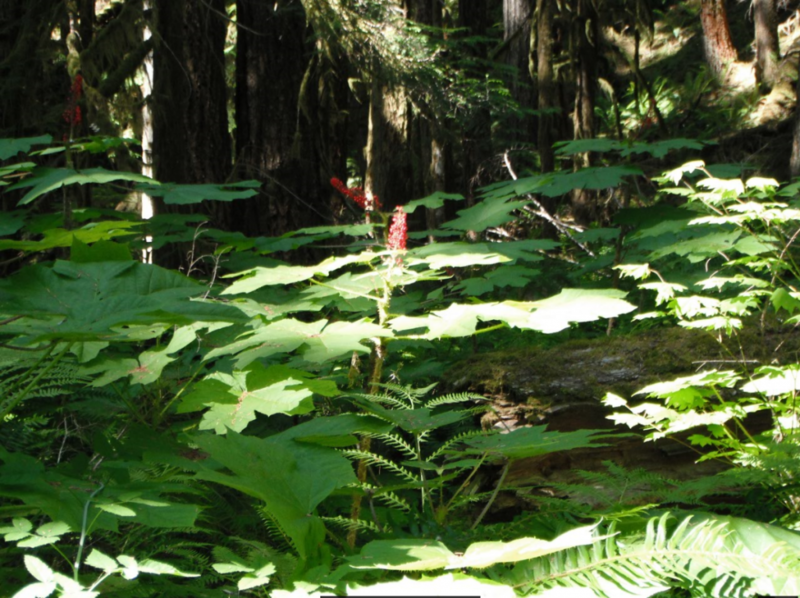 Use by Wildlife: Deer and elk may browse Devil’s club lightly in spring and summer. 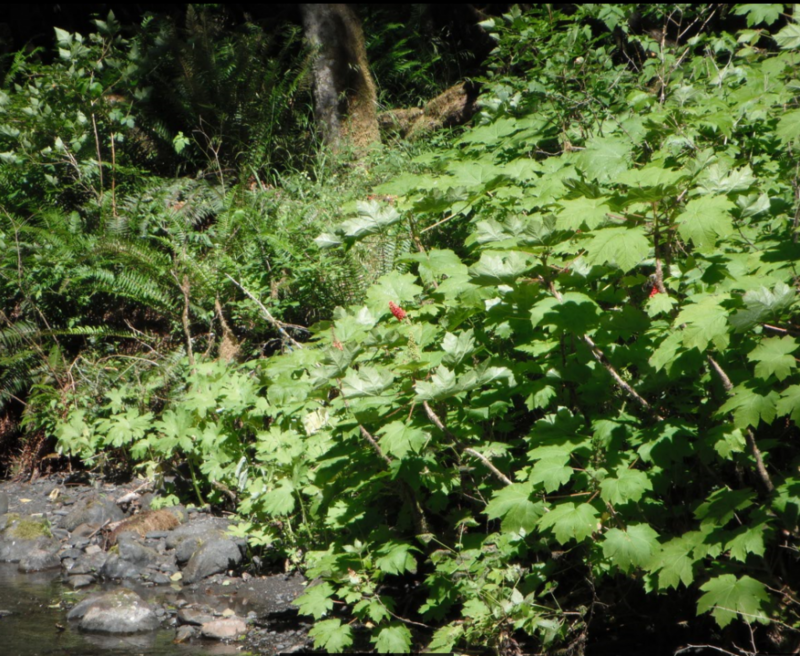 Devil’s Club growing along streams provides shade and cover for salmon and their eggs. Bear prefer these areas because of the readily available fish and berries! Bear also eat Devil’s Club leaves and stems. Devil’s club provides cover for various birds and rodents. 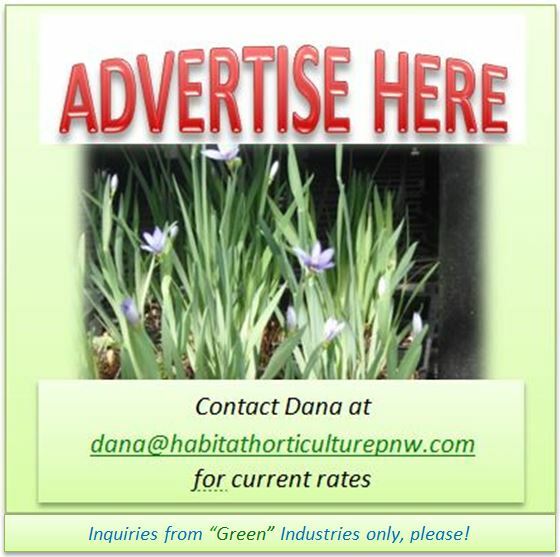 This entry was posted in Deciduous Shrubs & Vines on January 9, 2017 by habitatdana.